Join us on First Friday, December 3 for a very special event with Helen Hiebert — The Social Knotwork Project. Helen’s current artwork in the gallery involves untying knots and trapping the resulting string drawings between sheets of handmade paper. To encourage community participation, Helen is creating a knot database and you can contribute a knot to the project. 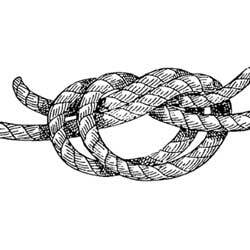 Just tie a traditional knot or make up your own knot using string, thread or cord and drop it off at the gallery sometime during the month of November. Then join us on First Friday to watch Helen make paper with the knots contributed. If you sew, fish, tie your shoes, crochet, rock climb, knit, or sail you’ll have a great time at this very special First Friday event. In the meantime check out Helen’s amazing knots here. And, just in case you are still hungry, we will be serving tea and cookies all day. We are featuring two very special selections of black and white teas courtesy of a lovely new teashop in our neighborhood called The Jasmine Pearl. If you have time, be sure to stop in and relax at their tea bar. Heather and her crew just celebrated their sixth anniversary as a tea maker by opening a new retail shop and tasting room just two blocks from the gallery. It’s a great addition to our fun little neighborhood. Above image: Red Gloves by Heidi Kirkpatrick. 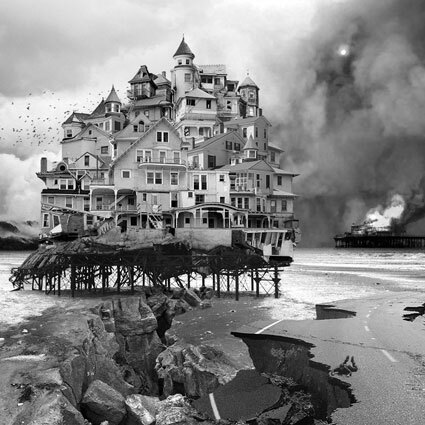 Congratulations to 23 Sandy Gallery artist Jim Kazanjian on his post today on Gizmodo. By mid-day he had already received 40,000 hits on his page. Jim is currently creating a new body work for his upcoming 2011 solo show here at the gallery. Can’t wait to see what warped new concoctions he comes up with! See the Gizmodo story here. In the meantime stop by to see the works we have in inventory in the gallery. Or, see his online catalog here. Artist Talk & Poetry Reading – TONIGHT! Join us for a very special evening with Helen Hiebert and Carl Adamshick. 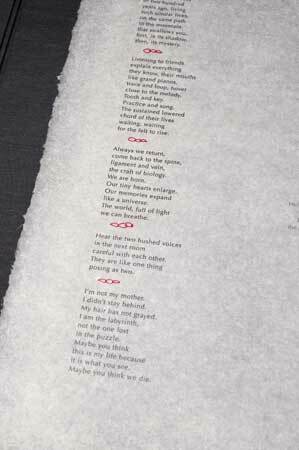 Helen’s String Theory suite is accompanied by a commissioned poem titled Similar Lives by Portland poet and recent Walt Whitman Award winner Adamshick. Come hear about the inspiration behind their collaboration. Did you see Alan Braden’s poem featured in the Poetry column in today’s Oregonian? It’s about the “brute geometry” of horses. 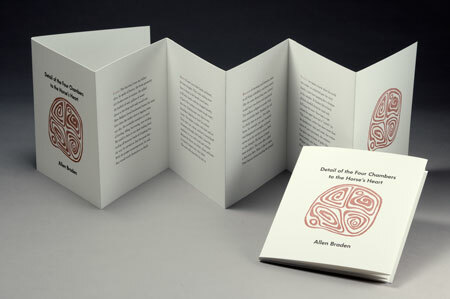 This poem is featured in an artist book we carry here at 23 Sandy of the same title, “Details of the Four Chambers to the Horse’s Heart.” A fine book by area letterpress printer Joseph Green using the full text of Braden’s poem. Two Lectures + One Workshop = One Fun Weekend! California artist Andie Thrams is well known for her gorgeous painted books. She works in the wild, often remote, western forests creating a collection of illuminated field journal pages that chronicle forest experiences with drawing, painting, and writing. Andie will be visiting Portland and we hope you’ll join us to hear more about her work and see her demonstrate the unique techniques that make her books so special. Andie was featured in our recent Book Power show here at 23 Sandy. If you’ve forgotten, never knew, or just want to delve more deeply into the language of color, come and find out how to get the colors you seek down on paper with ease and pleasure. 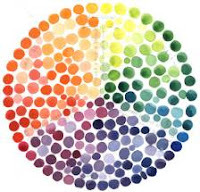 We’ll work both systematically and intuitively, to create a beautiful color wheel and complete other studies. Our experiments will focus on the autumn palette, inspired by fall subjects such as leaves, acorns and fungi. This workshop will deepen your awareness of how colors interact, what colors you are drawn to, and demonstrate how to make use of this powerful knowledge in future projects. $95 including materials. For more info, a supply list and registration please contact Andie directly at (530) 647-6947 or andiethrams@earthlink.net. Join us for a very special evening with Helen Hiebert and Carl Adamshick. Helen’s String Theory suite is accompanied by a commissioned poem titled Similar Lives by Portland poet and recent Walt Whitman Award winner Carl Adamshick. Come hear these two very talented artists talk about the inspiration behind their collaboration. Preview Helen’s show here. You can always find a list of upcoming events on Events page on our web site. Click here to check out other upcoming special events.